Was She Really a Bishop? There is a growing movement here in the USA to ordain women to every level of Holy Orders. This is not new. Liberal Old Catholic jurisdictions have been doing this for decades. In an attempt to justify their positions on this debate, many among liberal Catholics are suggesting that St. Bridget of Kildare and Ireland was actually consecrated as a bishop. Even within the Roman Catholic Church there is a vocal caucus of dissidents supporting the issue of women’s ordination. Much of the problem, as we see it is a result of individual ego attempting to supplant church teachings, and a lack of cogent exegesis and catechesis on the subject. My late uncle, Fr. William (Bill) Callahan, S.J., was actually instrumental in founding this and many other Roman Catholic dissident groups such as the Quixote Center, and Priests for Equality. In my BC days — before Catholic, I actually helped my uncle and others prepare protest signs for a Washington D.C. march. As a bishop in a conservative Catholic jurisdiction that limits our episcopal orders to men, if she were actually a bishop, then we may have to re-evaluate our position on women in holy orders in general, and women in the episcopacy in particular. Last year I wrote an article where I asked the question if there had ever been licitly ordained women priests or bishops? Today’s article is adding a bit more background to that question. After doing due diligence, my stance on the matter has not altered. My conclusion is that St. Bridget was a very influential Abbess in her day. No, she was not consecrated to the episcopacy as a Bishop. Rather, she was the Abbess of a monastery, possibly more. Legend and culture of that era make it difficult to pinpoint much fact from fiction. 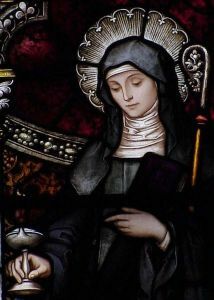 There is little doubt that St. Bridget was a real and influential spiritual leader in her day, even having a great friendship with the venerable, St. Patrick. The mitre and crozier are historic signs of authority, which abbots and abbesses use routinely to this very day, not necessarily as signs of consecration to the episcopacy. Generally speaking, people see the mitre and crozier and automatically think that the person is a Bishop but that understanding shouldn’t be automatically assumed. All Abbots and Abbesses are the ordinary authority in the monastery. According to the Rule of St. Benedict the Abbess or Abbot is to be obeyed as if they are Christ. A friend of mine who is an Abbot of a Cistercian monastery, wears the mitre and crozier to Mass, even before he was consecrated a Bishop. Mother Angelica could have carried a crozier and worn a mitre if she chose to do so. There is a stained glass window of St. Brigid of Kildare in St. Joseph’s Church in Georgia. (pictured above) The window shows her holding the crozier which is a symbol of authority. Many Icons show Abbesses with crozier and mitre or even a crown. The position of the International Catholic Confederation regarding women in Holy Orders is not taken out of a sense of Patriarchy or even misogyny. No, as a jurisdiction we have a deep and abiding respect for women. Our orthodoxy is not based upon modern political correctness, but, rather, from the historic deposit of faith. Our position is that, in Jesus day, the concept of a female priesthood was not foreign. There were multiple pagan cults in that era that had priestesses. It would have been quite easy to have chosen pious women from among His disciples to become Apostles — yet He didn’t. It is the witness of church history including the records of Church Councils, that the Church has never actually condoned the elevation of women to the episcopacy, let alone to the priesthood. Like St. Bridget, however, there are indeed important roles of authority and ministry that we welcome women to serve. It is my prayer, that as the presiding bishop for the International Catholic Confederation, that our views on this matter are taken with the same spirit with which they are presented, with love, respect, and compassion.